56 year old lady recurrent presentations to your practice for polyuria and increased thirst. Random serum glucose and urinary glucose have returned normal. Patient has otherwise been well, complains of no dysuria, haematuria, fevers or night sweats. Diabetes Mellitus: A group of metabolic diseases in which there are high blood sugar levels over a prolonged period. 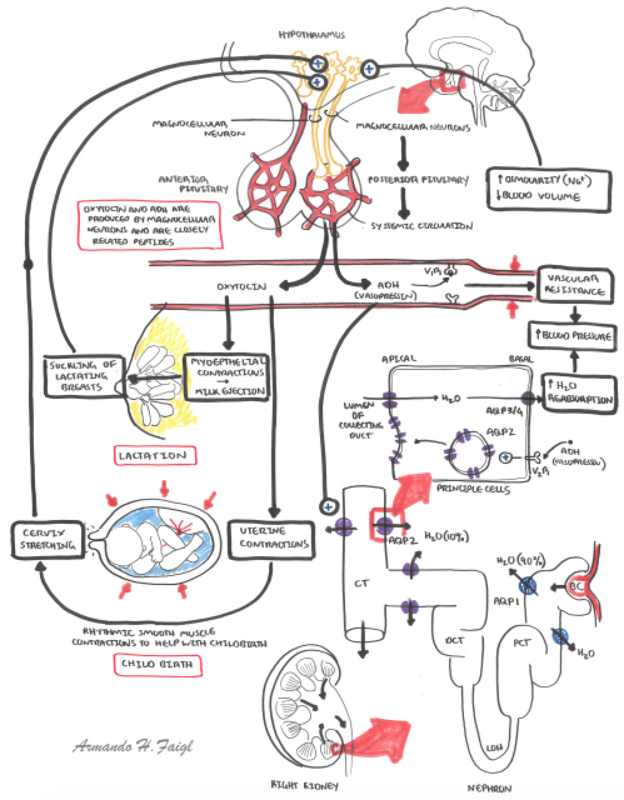 Antidiuretic hormone is initially produced by the hypothalamus and then transported to the posterior pituitary gland via the pituitary stalk for storage. When osmoreceptors sense hyperosmolarity in the blood it stimulates the posterior pituitary gland to release ADH into systemic circulation. As a result, there is a net increase in water reabsorption in the collecting duct, leading to appropriate reservation of water and concentrating urine. Wolfram syndrome is a genetic autosomal recessive disorder with the Tetrad: diabetes insipidus, diabetes mellitus, optic atrophy and deafness. Nephrogenic DI caused by ineffective response to ADH in the kidneys, such as defective ADH receptors caused by genetic defects. 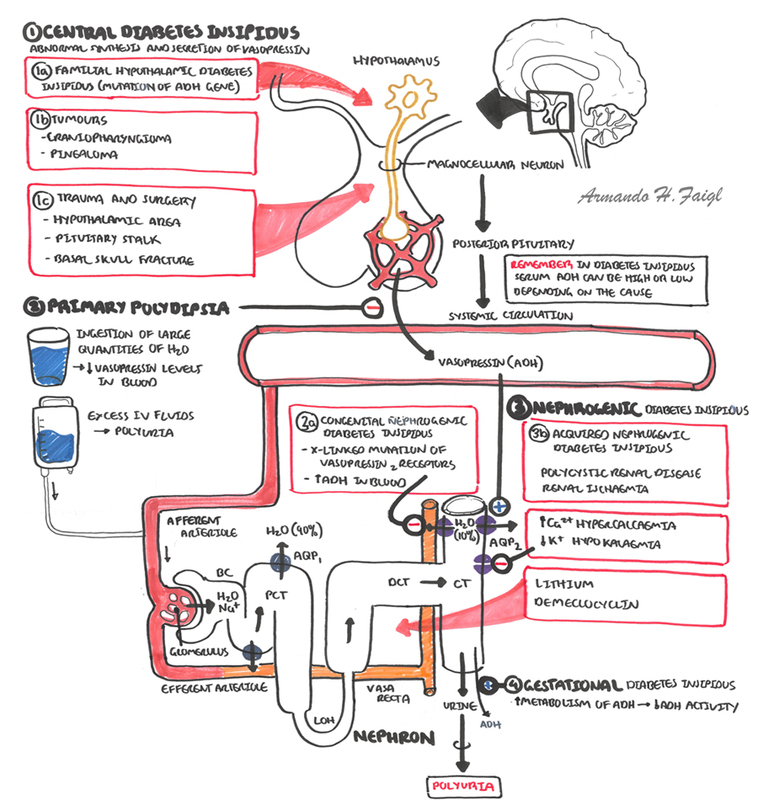 Dipsogenic DI (also known as primary polydipsia) results from excessive fluid intake practiced over an extended period. Sometimes not classified as a true diabetes insipidus. Gestational DI During pregnancy, vasopressins are more readily metabolised peripherally by placenta hormones. Hence it can provoke transient “central DI” in some patients. Commonly, this condition resolves spontaneously upon delivery. Traumatic or pathological damages affecting the hypothalamus or posterior pituitary gland causes cell death in hormone secreting cells in those areas, thus affecting the normal secretion and release of ADH. Without appropriate stimulation of ADH in the kidneys, renal collecting ducts lost its ability to perform adequate water reabsorption essential for volume maintenance of the body, resulting in a diuretic phenomenon. Nephrogenic DI is caused by defective ADH receptors in the kidneys. Normally, two receptors AVPR1 and AVPR2 responds to increasing levels of ADH in the systemic circulation. AVPR1 is responsible for vasoconstriction and prostaglandin release, whereas the AVPR2 receptors mediated the antidiuretic response as well as certain coagulation factors (factor VIII and von Willebrand’s factor), hence unresponsive AVPR2 receptors in nephrogenic DI causes diuretic effects as well as mild coagulation defects. For patients with significant underlying aetiology, DI typically resolves following the resolution of the underlying condition (e.g. correction of hypercalcaemia may result in resolving the presenting DI). With one exception that for lithium therapy induced DI, the condition is usually irreversible. 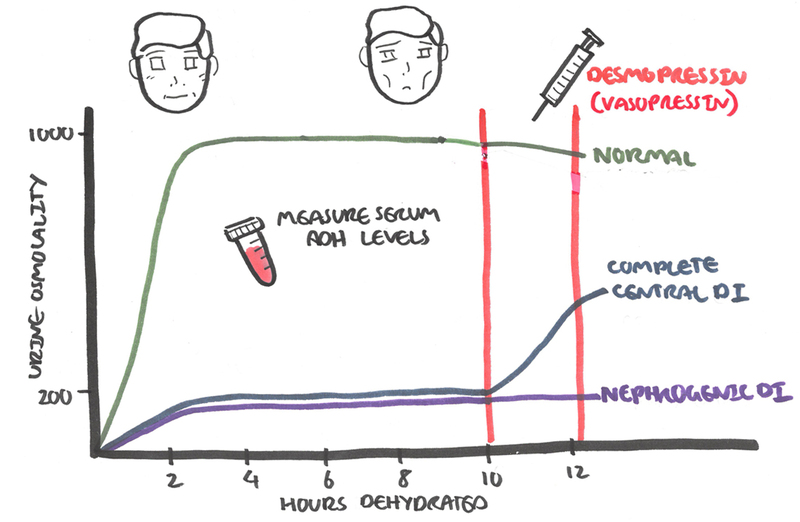 For patients with irreversible DI, lifelong follow up with monitoring is necessary, with regular assessments of their fluid status, electrolyte and renal functions. They are generally stable with good control by desmopressin, and if indicated, pituitary hormone replacement.